September | 2015 | The British in Crete, 1896 to 1913. Canea 1897. Two views of the bastion. Canea Bastion 1897 Photograph showing the flags of the occupying Powers. Shows that, if nothing else, the photographer and the illustrator had the same idea about what made a good viewpoint. 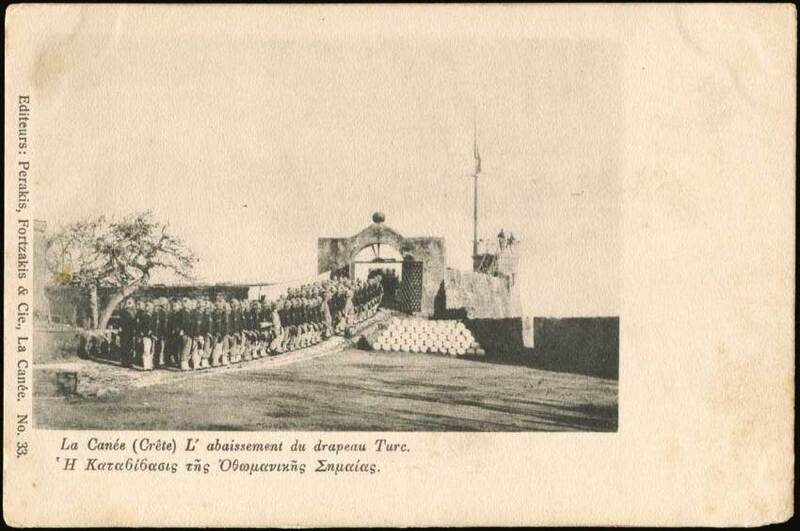 This entry was posted in European Intervention Crete and tagged British Army, Canea bastion, Crete 1897, European Intervention Crete, International troops on September 27, 2015 by Mick McT. Upon arrival on Crete in February 1897, the International forces were, in effect, reluctant allies of the Ottoman Empire. The European objective at that time was to bring a halt to the inter-communal strife brought about by the Cretan Christian insurrection and to prevent the annexation of Crete by Greece. 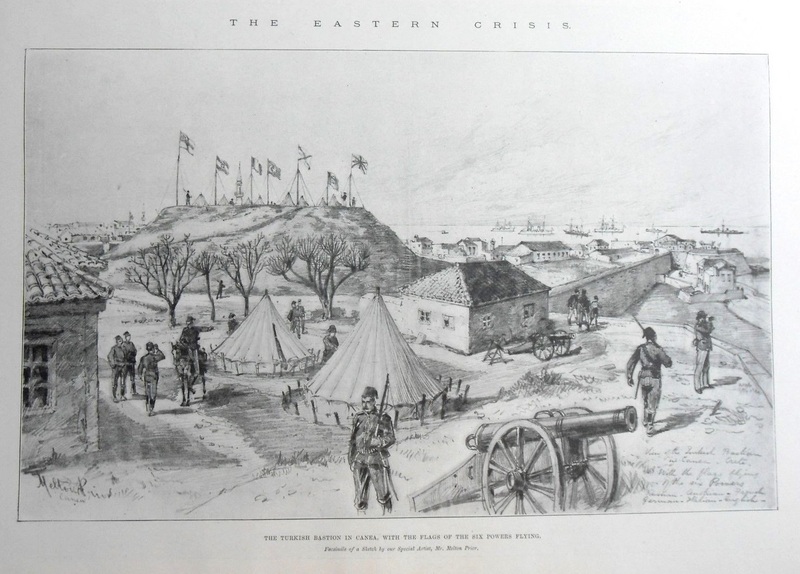 While part of the European peace keeping strategy was to proclaim a blockade of the island to prevent both Greek and Ottoman reinforcements arriving, and hence exacerbating an already volatile situation, they still had to co-operate with the existing Ottoman garrison of the island. This garrison consisted to two elements, regular Ottoman Army units and locally raised volunteers; Bashi-bazouks, a term originally applied to irregular mercenary troops within the feudal Ottoman Empire. 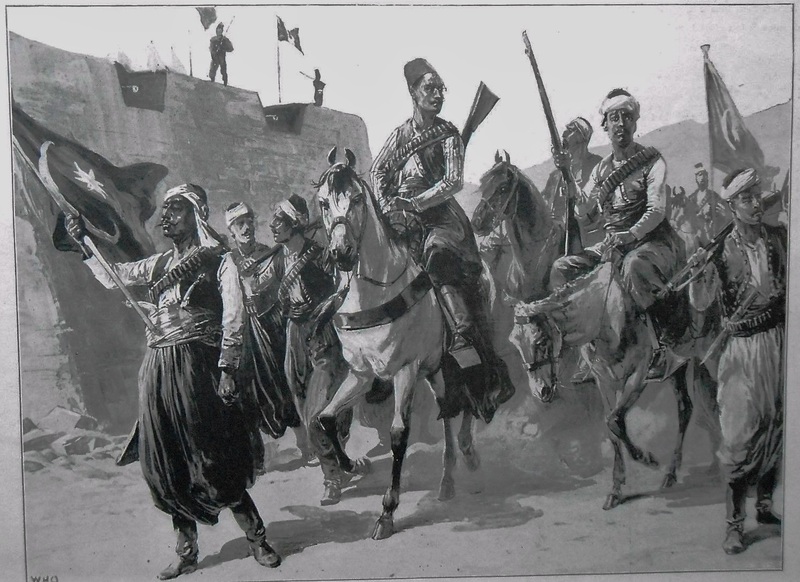 The regular Ottoman soldiers on Crete, though often treated with disdain by the British, had at least a recognised, and recognisable, command structure. 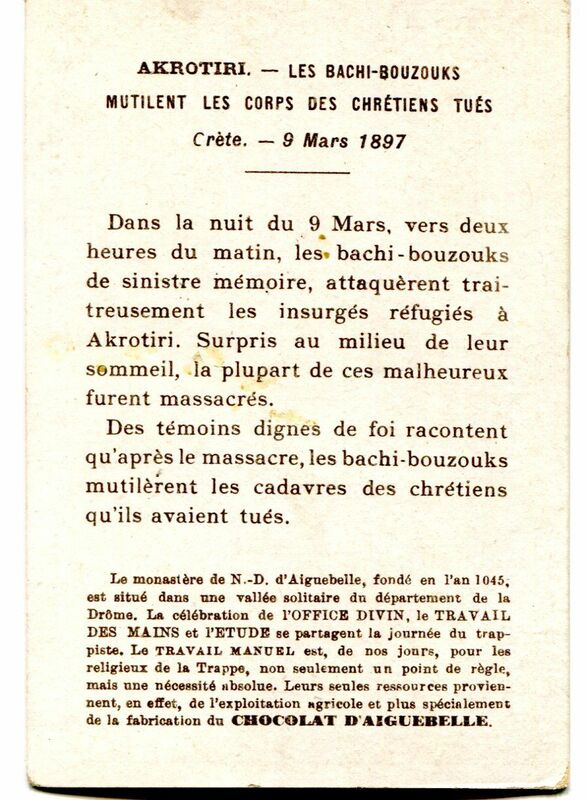 However, the Bashi-bazouks on Crete at this time, in part raised, armed and paid for by the Ottoman authorities as a sort of Muslim home guard, and formally on the ration strength of the Ottoman army, were much less formal and, apparently, nearly totally undisciplined. 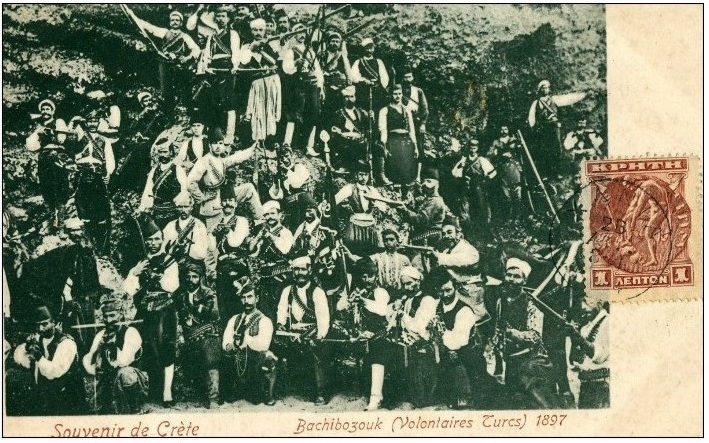 Bashi-bazouks 1896. 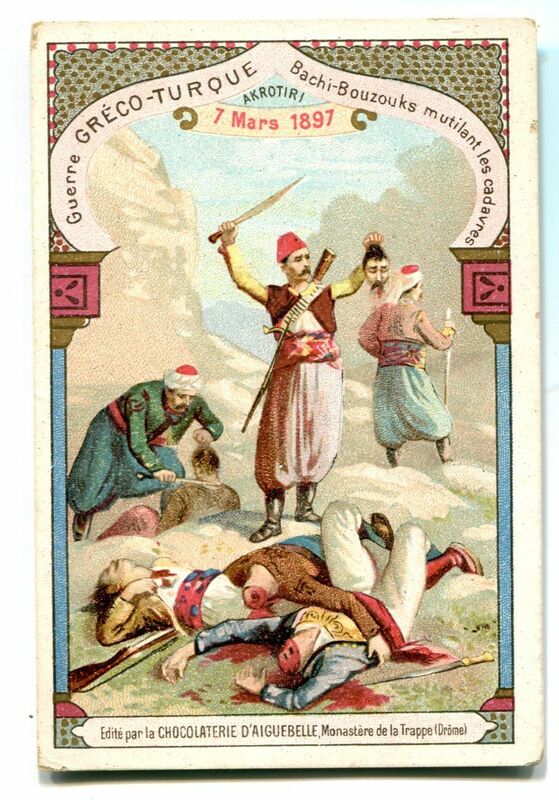 Note the presence of regular Ottoman troops, giving the lie to the suggestion that Bashi- bazouks were merely groups of armed Cretan Muslims. March 1897. Romanticised view of Bashi-bazouks. Fort Izeddin, Suda bay, in the background. 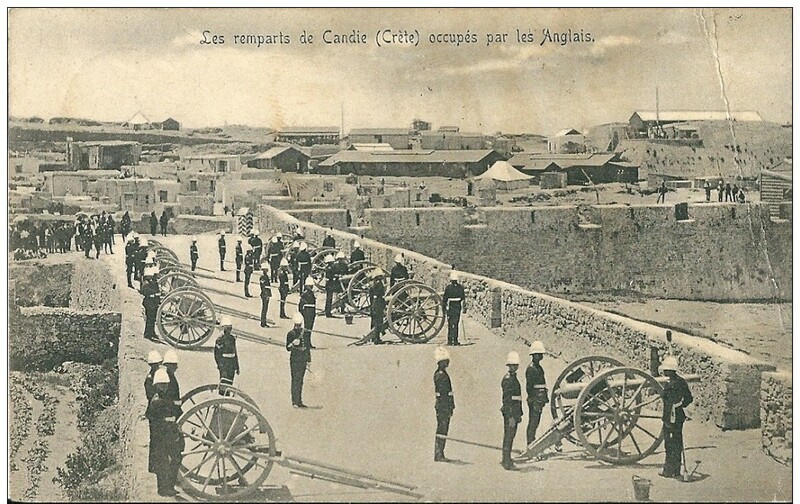 With the events of 6th September 1898 any pretense that the Bashi-bazouks were in any sense allies of the British had gone, and the murders carried out by them in Candia, coupled with the failure of the regular Ottoman troops to take action to stop them, resulted in the Ottoman eviction from the island. This entry was posted in European Intervention Crete, Ottomans in Crete and tagged Bashi-bazouks, Bashi-bazouks Crete 1897, Crete 1897, Crete 1898, European Intervention Crete, Ottoman soldiers, Ottomans in Crete on September 15, 2015 by Mick McT. Although undated and giving little or no information other than it’s the English in Candia, the photograph has been provisionally identified as members of the Royal Artillery manning 2.5 inch Rifled Muzzle Loading guns, mounted on Whitworth carriages. This being so, it shows the No. 4 Mountain Battery, Royal Artillery sometime between 26th April and late December 1897, the only time during which the Royal Artillery served on Crete. (The final departure date is illegible on the original record, but the H.Q. Company left on 21st November 1897 and the whole detachment were in Malta by 21st December.) Capt. Brian Payne R.A. retired, to whom many thanks go for his assistance with this post, pointed out that the picture is obviously staged in that there is no ammunition visible and the guns are not run up to the embrasures. Had they been fired in this position there would have been rather a lot of debris flying about! According to the Battery diary, their time was split between peace keeping duties and parades. In pursuit of the former, in addition to manning the guns on the ramparts of Candia, on at least one occasion they sent a detachment out into the Insurgent controlled area for 5 days to support the Seaforth Higlanders given the job of repairing the aqueduct supplying the bulk of Candia’s water. No hostile activity is recorded on this occasion. However, on 31st July , “[p]reparation [was made] for anticipated by Turkish Irregulars” – the word ‘mob’ is struck through on the original. Later, on 4th August the “O/C Battery was stoned by [the] mob.” Their final ‘action’ appears to have occurred in December when a detachment “…accompanied Sir Herbert Chermside to outposts, and [was] fired on for 1/2 hour by [Christian] Insurgents.” In spite of the provocations from both sides, and it seems that they were taking an even handed approach to the Cretan situation and upsetting both sides equally, there is no record that at any time that the Royal Artillery were required to use their guns in anger. On a more peaceful, but no less martial, note, the Battery participated in two big parades alongside detachments from the other International forces. On the first, which took place on 4th May 1897, they ” [t]ook part in [a] General Review order parade, held in honour of Italian troops, who marched past and were saluted by each British unit.” Then on 22nd June they “[t]ook part in a special parade held in honour of Her Majesty the Queen, having completed her 60th year of reign, and was inspected by the Admirals of the French, Russian, Austrian, Italian and English Fleets, and Russian and Italian Military Commanders. This entry was posted in British Army in Crete, European Intervention Crete, Royal Artillery and tagged Candia, Crete 1897, European Intervention Crete, Royal Artillery Crete 1897 on September 9, 2015 by Mick McT. Those who remain in Crete. 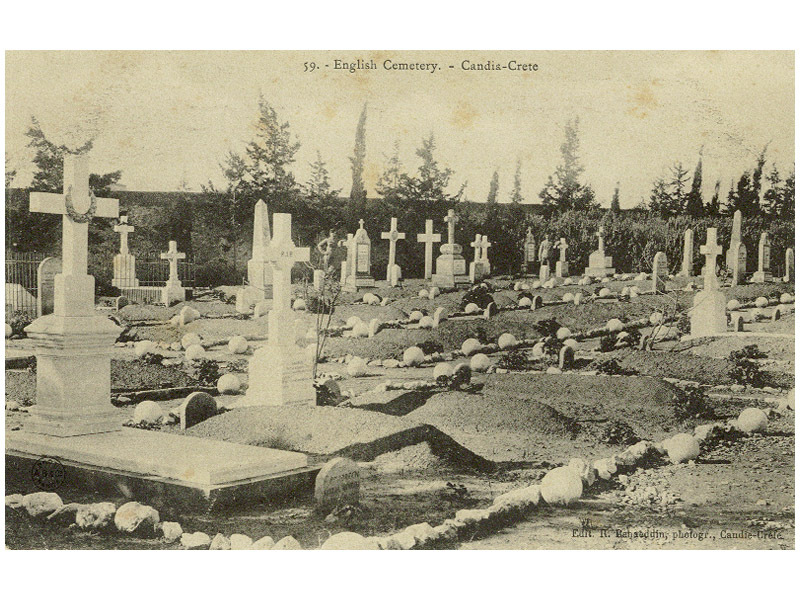 Around 175 British military personnel died on Crete between 1897 and 1913; the actual figure is difficult to determine because of the lack of a central army record and lack of detail in the naval records. The bulk of those who died on the island are commemorated at two sites: 24 in the Commonwealth War Graves Commission site at Suda Bay and the remainder in British memorial graveyard located in the cemetery of Agios Konstantinos and Eleni, 42 Odos Knossou, Iraklion. One further member of the 1/Seaforth Highlanders is listed on the Seaforths’ memorial in Edinburgh as having died in Crete, but his name does not appear on either of the island’s memorial sites. British military cemetery, Iraklion. Date unknown, early 1900s. Gate of British Cemetery Iraklion. 2015. 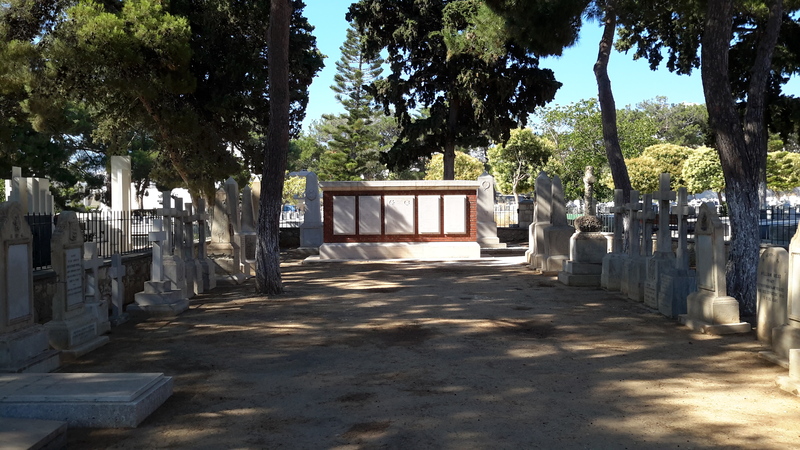 British Cemetery Iraklion. 2015. The memorial wall at the rear lists names of those originally interred here. Of those who died of other causes, an examination of the records from the Commonwealth War Graves Commission relating to Suda Bay, the Parliamentary returns from the Army Medical Department and the memorials in Iraklion shows the following causes of death for British military personnel: Five died of drowning, four in one incident, one murdered by a colleague, one suffered a judicial execution, three suicides, one ‘dislocation of the spine after a fall in a ditch’, one died of appendicitis, one of ‘internal strangulation after an operation’, and three died of alcohol poisoning. The overwhelming majority of the remainder died of disease. The main killer was Enteric Fever – Typhoid. This accounted for 53 deaths overall, 38 of them in 1898 with the influx of troops following the September riot; many of these troops coming straight from the Sudan Campaign. (The 2/Rifle Brigade and 1/Northumberland Fusiliers are recorded as suffering in particular as a result of this campaign.) Dysentery and Malaria were the next highest killers inflicting 11 and eight fatalities respectively. However, the figure for fatal cases of Malaria belies the reality that this disease was the greatest medical drain on the British Armies resources in Crete; nearly 5,000 hospital admissions for Malaria alone being recorded between 1897 and 1909. 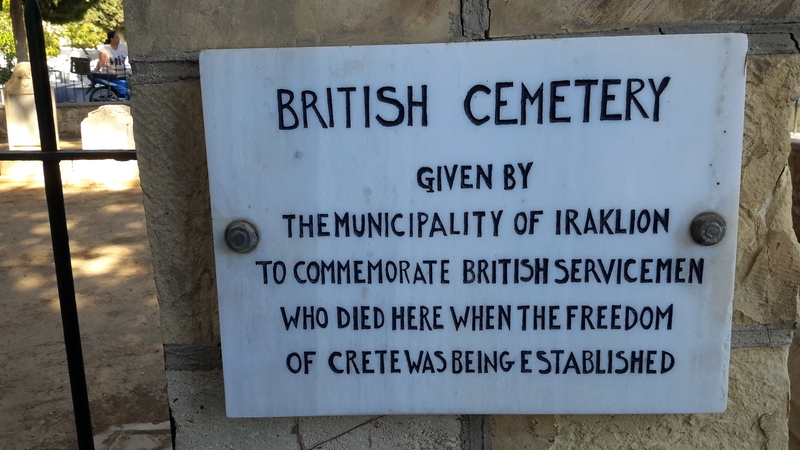 This entry was posted in British Army in Crete, European Intervention Crete and tagged British Army, British memorials Crete, European Intervention Crete, Iraklion cemetery, Suda Bay CWGC on September 5, 2015 by Mick McT. 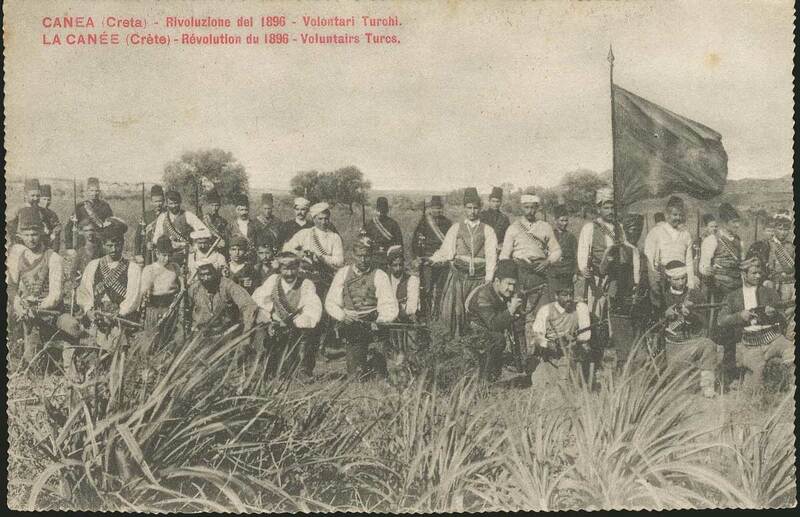 Lowering the Ottoman Flag on the Firka, Canea. 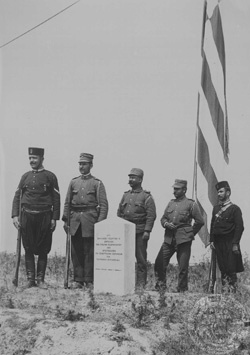 This photograph is undated, but the last time the Ottoman flag flew on Crete, other than the retention of a symbolic flag on Fort Suda in the middle of Suda Bay, and possibly one at Fort Izzedin, was probably on or about 21st December 1898 when Price George of Greece arrived to take up the post of High Commissioner of the newly created Cretan Autonomous State. The nationality of the troops in the photograph above is unclear, but they are possibly Italian since Canea was the base of the Italian occupied secteur. Following the arrival of the International troops in 1897, the Ottoman flag flew on the Firka under international guard in order to reinforce to the Cretan Christians the determination of the European Powers that Crete should not be united with Greece. On 3rd November 1898, on British orders, the Ottoman flag was hauled down in Candia in order to make it clear to the Ottoman authorities that their time on Crete was over. However, it was allowed to be flown again on 6th November after the eviction of all Ottoman troops and officials from the island: this time in order to show to the Cretan Muslim population that their rights were to be respected even though their co-religionists were no longer in power. Raising the Greek flag, Suda Bay 1913. 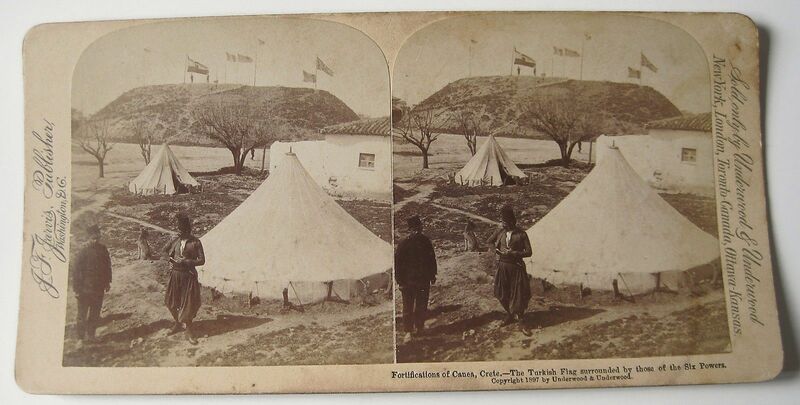 This entry was posted in Enosis, European Intervention Crete, Ottomans in Crete and tagged Crete 1897, Fort Izzedin, Fort Suda, H.MN.S. Yarmouth 1913, International troops, Ottoman flag on September 2, 2015 by Mick McT.